On Monday, February 3, I traveled down rain-soaked roads to the Fort Lee Regional Archaeological Curation Facility (RACF), accompanied by Virtual Curation Laboratory (VCL) staff members Allen Huber, Rachael Hulvey, and Lauren Volkers. We were accompanied by our trusty NextEngine Desktop 3D scanner and a new member of our technological team: the Sense 3D scanner. To make things more cozy, we also had with us four boxes of artifacts we had on loan from Marine Corps Base Quantico that are held in trust by RACF. These four boxes contained artifacts scanned for our initial Department of Defense (DOD) Legacy Project-funded entitled Virtual Artifact Curation: Three-Dimensional Digital Data Collection for Artifact Analysis and Interpretation. We provided the archaeology staff at RACF with replicas of some artifacts that we had scanned with the NextEngine Desktop 3D Scanner and printed with our MakerBot Replicator to use in their public archaeology programs. Mike and Tiffany examine printed replicas of artifacts. In addition to returning artifacts, I also spoke with RACF’s Curator of Archaeology, Amy Wood, about the new DOD Legacy Project that RACF and VCL are doing in collaboration entitled Virtual Mobility Archaeology Project with Further Applications of Three Dimensional Digital Scanning of Archaeological Objects. We are working to ensure that the digital models that we are creating from collections curated by RACF and our other research partners are readily available for study and manipulation on portable electronic devices. 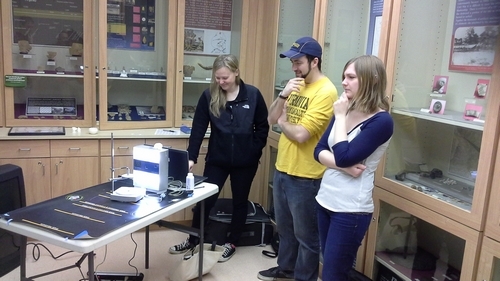 Lauren, Allen, and Rachael scan artifacts on exhibit. 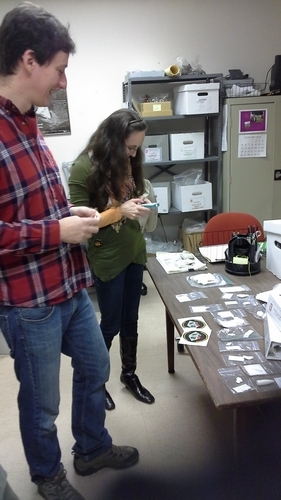 While at RACF, Lauren, Allen, and Rachael worked to scan some of the artifacts that they have on display in their small, but well designed museum. This we are doing partly because of the research value of the artifacts but also to potentially further raise people’s awareness of the archaeological resources recovered at Fort Lee. These artifacts were scanned with the NextEngine Desktop 3D scanner. We were assisted in our efforts by RACF archaeologists Tiffany Newman, Mike Makin, and Bryce Stanley. RACF staff also facilitated a new loan of animal bones (fox, deer, and opossum), artifacts (diagnostic chipped stone tools), and fossils (shark teeth). 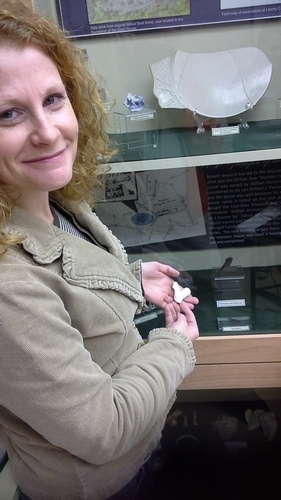 Amy Wood compares a printed replica of a pipe to the one on exhibit. 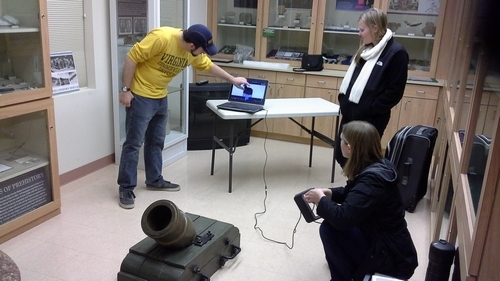 We ended our visit to RACF by using the Sense 3D scanner to made a digital model of a Coehorn mortar recovered from Petersburg National Battlefield. The next day we also printed a scaled-down version of the mortar using our MakerBot Replicator. Rachael, Allen, and Lauren scanning the coehorn mortar. We look forward to returning to RACF and scanning additional objects on display in their museum.